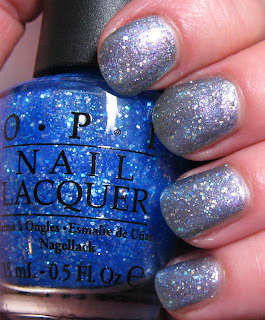 Today I decided to swatch the OPI Katy Perry Collection, minus Black Shatter. I've shattered so many other shades, I just wanted to take a break from the crack! 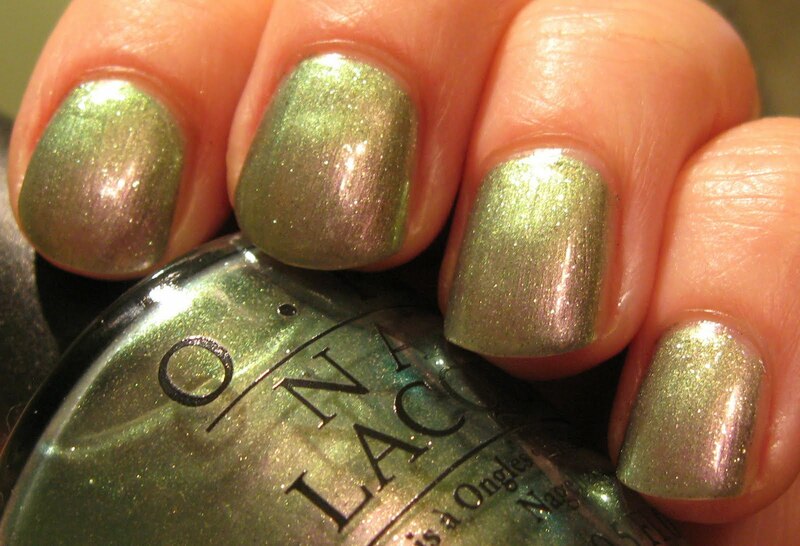 Below: Not Like the Movies is a pale violet/moss green duo chrome that is also graced with silver glitter. At first, it really looked like nothing more than a grey shimmer, but once I started moving around into various lighting, this polish becomes much more chameleon-like. Hints of pinks, purples, greens and greys are all on display, depending on your lighting. Below: I used one coat of Last Friday Night over Not Like the Movies for this look. It dims the duo chrome of Not Like the Movies and the base color becomes more grey in lower lighting and more of a grey/blue in brighter lighting. 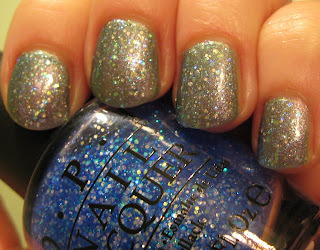 Last Friday Night is a glitter explosion of iridescent blue, green and silver in a clear tinted light blue base. 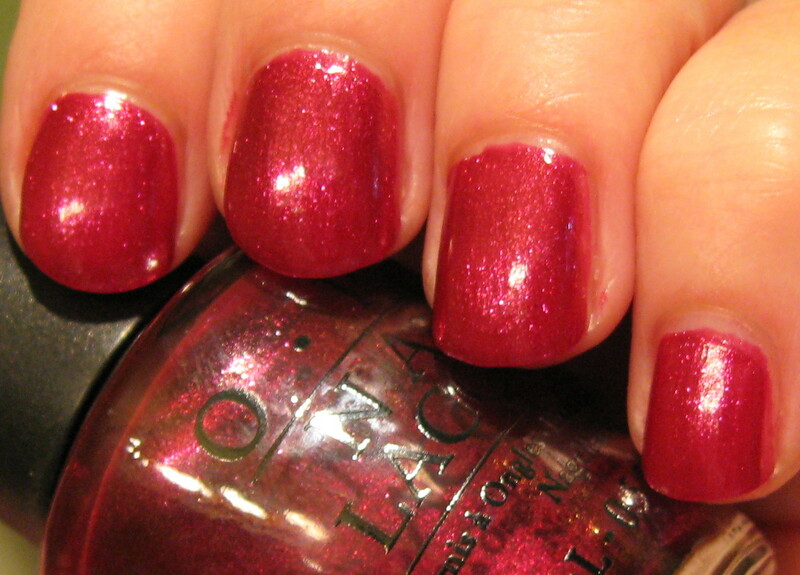 Below: The One That Got Away is a vivid berry shade with tiny foil glitter. 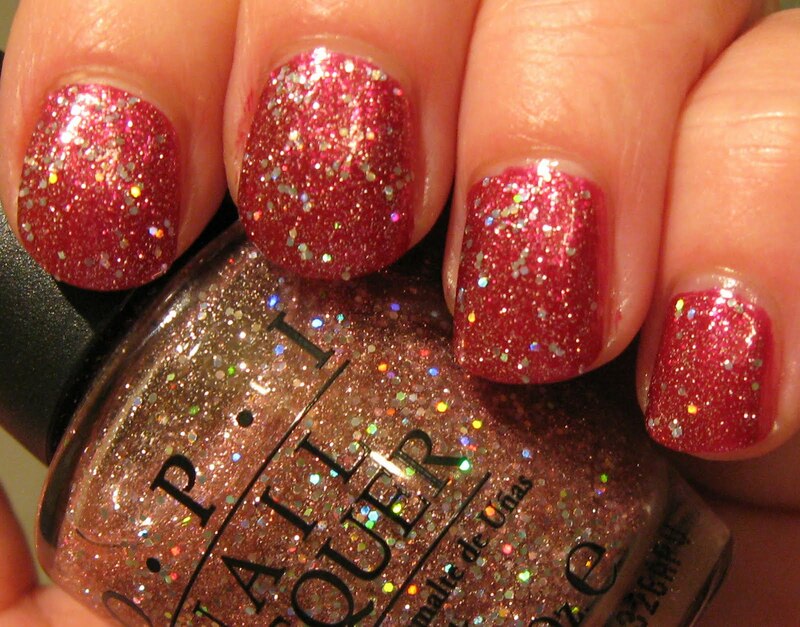 The glitter is just a step lighter that the base, and that contrast creates a warm glowing effect to this shade. 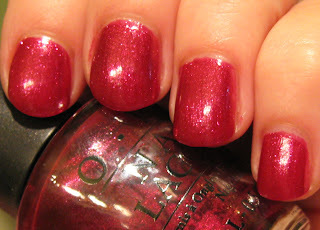 Below: I used Teenage Dream as a top coat over The One That Got Away for this look. Teenage Dream is a dusty pink/salmon shade in a tinted, almost clear base. It's filled with tiny silver glitter and larger iridescent multi colored glitter. All in all, this is a powerful collection of shades and finishes--with just five shades including Black Shatter, you have a range that includes glitters that work on their own or as a top coat, a shimmer with foil glitter, a duo chrome, and a shatter. I have a number of other full collections made up of 12 polishes, and most of them don't manage to come anywhere near this level of creativity, even with 12 chances! The two glitter top coat shades do build up enough color to wear them alone (3 coats I find works well), particularly Teenage Dream. My preference is to use them as a top coat though, simply because I hate removing glitter and they remove easier over a base color. 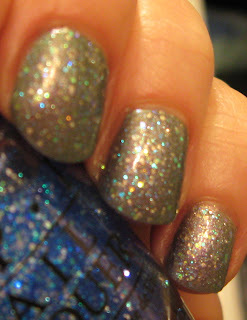 The hint of color in their base doesn't do a dramatic change on whatever base color you use, but the iridescent glitter adds a nice touch of sparkle to just about any shade. i got teenage dream and not like the movies... the one that got away truly turned out to be the one that got away from me! totally not tired of this collection.. the more I see it the prettier it is! I still have to get Last Friday Night. It's the only one missing now that I have swapped for the other 3. I don't care for the black shatter so I won't be getting that one. I was at my local nail supply shop and skipped out on these...must go back when I have more funds! heh. 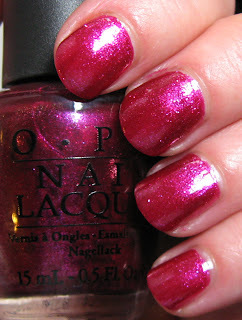 I got them all on a giveaway and i was so excidet to try them...These are my first OPI nail polishes, and i must say i was very disapointed..Dont like the formula of both polishes (not the glitter ones, they are awsome for layering, but not for wearing only them on my nails, they are to watery, and sorry, for that price that they cost, just not good...3 coats for 5-10 $ polish is just dissapointing.. Since I only order these online I haven't been able to get them. I don't know when they will ever be in stock. They all look so pretty and I can't wait to get them. Looks like I will be waiting!